It was a tree and it grew in Brooklyn. But it had nothing to do with the 1943 novel by Betty Smith. This tree was in the back yard of a two-story red brick apartment building at 311 E. 92nd St., where my grandparents lived. David and Lena Levine – Bubbie and Zadie – were my father’s Russian immigrant parents. They lived in the upstairs rear apartment, the one many landlords and owners of Brooklyn apartments chose for themselves – upstairs so they wouldn’t be disturbed by footsteps from people living above them, and in the rear so they were buffered from street noise. Our family lived an easy seven-block walk from the house on 92nd Street. We visited frequently and one of my clearest memories of that apartment is the cherry tree in the back yard. In the late spring and summer we would lean out one of the bedroom windows and pick cherries from the tree. When those were all gone, we would climb a ladder to get up into the tree. After we left Brooklyn and settled in L.A., my parents, sisters and I would make a day trip every year to Cherry Valley in Riverside County. I would climb into a tree at one of the you-pick-‘em orchards and stay there for hours. For every cherry that went into my bucket another would go into my mouth. There was no charge for what we ate on site; we paid by the pound for what we took home. Years later I met and married Jennifer, who used to say if she were stuck on a dessert island with only one food to eat it would be cherries. Then we had two sons and made the annual trek to Cherry Valley with them. 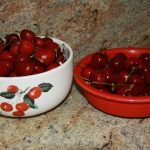 These are the memories that return to warm me during cherry season each year, as they did a week or so ago, when I found the first-of-the-year cherries at my favorite super market. They were large, plump, red, sweet cherries. But all it said on the display was “red cherries – grown in California.” I don’t know what kind of cherries they were. But it’s a good bet they weren’t Bings. If they were it would have said so on the display. Bings are the Rolls Royce of cherries and the kind that are most familiar and sought after. Cherries fall into two groups – sweet and tart. You won’t find the tart ones in the produce section of your local market, or even in the bins at many farmers’ markets. They have a very short shelf life and store poorly. Tart cherries are used primarily in baking and cooking. Most tart cherries are grown in four states that boarder the Great Lakes – Michigan, New York, Pennsylvania and Wisconsin. Michigan is responsible for between 70 and 80 percent of U.S. production each year and the four states combine for between 85 percent and 90 percent of the U.S. tart cherry crop. In Pennsylvania the cherries are grown on the eastern slopes of the Blue Ridge Mountains. In the other states they are grown in areas adjacent to one of the Great Lakes. There has been extensive research regarding the health and pain management benefits of tart cherries. We cannot give medical advice and you should consult a physician before embarking on any course of pain management. However, a study published in the British Journal of Sports Medicine in 2006 claimed tart cherries help athletes reduce muscle damage and recover faster from a tough workout. A study published in the Journal of the International Society of Sports Nutrition in 2012 said runners who drank cherry juice twice a day for seven days prior to and on the day of a long-distance run had significantly less muscle pain following the race. And a study reported in the Scandinavian Journal of Medical Science in Sports in 2010 said marathoners who drank cherry juice five days before, the day of and two days after running experienced faster recovery of strength, increased total antioxidant capacity and reduced inflammation as compared to a non-cherry beverage. Tart cherries and cherry juice also have been reported to provide relief from the pain or arthritis and gout by lowering levels of uric acid in adults. Of course, I didn’t know any of these things when I leaned out that second story window in Brooklyn or climbed a tree in Cherry Valley. It wouldn’t have mattered anyway because the cherries I was picking and eating were not the tart ones. I don’t know what kind of cherries grew on the tree in Brooklyn. I do know, however, that my mother always searched out Bings to bring home from the market and we always looked for orchards that grew Bings when we went picking. Bings are one of the cherry types included in the classification of sweet cherries, or wild cherries. Bings have a purple-red flesh and a red skin that can be close to black when fully ripe. They begin to ripen around the 4th of July and are available into August. They account for 60 to 70 percent of all cherries shipped from California and don’t grow well on the east coast. Lamberts – smaller than Bings and more heart shaped; also dark red; available until late August. Rainers – a yellow or pinkish skin; milder and sweeter than Bings; grown in very limited quantities, mostly in Washington State. Royal Anns – a bluish-yellow skin; often canned or made into maraschino cherries. Brooks – developed by the University of California, they are very tolerant of hot weather and ripen earlier than Bings. Chelan – does not do well in hot, dry weather; ripens a couple of weeks before the Bings; taste best when the skin is a mahogany color. Bada White – not actually white, but more yellow with a pink blush; developed by the California Agricultural Experiment Station; I’ve never seen these on sale. Tieton – developed by Washington State University; big, firm fruit with thick stems. Turkey is the world leader in production of wild cherries, which also are grown throughout Europe, western Asia and parts of northern Africa. Archeologists believe cherries have been eaten in these areas since prehistoric times. A cultivated cherry is believed to have been brought to Rome from what is modern day Turkey as early as 72 BC. The U.S. ranks second behind Turkey in sweet cherry production with just 13 percent of the worldwide crop. Most Sweet cherries grown in the U.S. are found in Washington, California, Oregon, Wisconsin and Michigan. Cherry trees require significant irrigation and spraying and the fruit is easily damaged by rain and hail. Cherries are harvested by several methods, all of which are very labor-intensive methods, which make cherries a relatively expensive consumer product. Most claims regarding health benefits of cherries focus on the tart cherries. They have higher concentrations of the anthocyanins that block enzymes associated with inflammation. They also rank higher than red wine, prunes, dark chocolate and orange juice in antioxidants. That doesn’t mean sweet cherries are lacking in these benefits; they just aren’t as great. All cherries are a good source of vitamin C and fiber and a cup of sweet cherries has just 90 calories. Cherries also contain significant amounts of melatonin, which can help in regulating sleep and combat jet lag. I like my cherries at room temperature so the chill doesn’t mask the flavor. For storage, however, it’s in the refrigerator. I take them out about 45 minutes before I intend to eat them. Most super markets these days, and even some farmers’ markets offer cherries only in pre-packaged plastic bags. I prefer to find a bin full of loose cherries and pick through them myself. I look for ones with fresh green stems and reject any that are soft or squishy or are bruised or have cuts. Bad cherries in a bin can start others down the road to degradation. So, if I find more than just a stray bad one or two I’ll walk on and find another place to buy my cherries. I doubt that many people go to the market to buy cherries as health food any more than I leaned out that apartment window in Brooklyn or climbed those trees in Cherry Valley for that reason. It’s the taste that is the siren song that calls us back each spring and summer. So don’t feel guilty when you sit in front of the television set or out on the patio this summer with a bowl of cherries beside you. How often do we find something that tastes so good and is healthy at the same time?